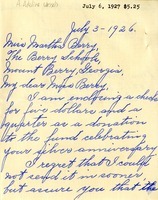 Mrs. ... ... sends a check for $5 to help Miss Berry's good work. 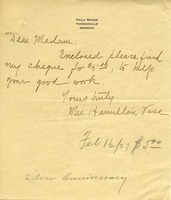 Mrs. Wessels sends a check for $5.25 to go towards the Silver Anniversary fund. 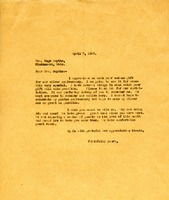 Martha Berry thanks Hugh Smythe for a gift that Smythe sent to Berry. 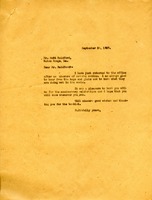 This gift was received on the occasion of the Silver Anniversary for Berry. 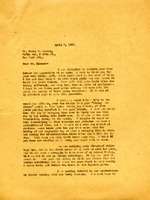 Berry encourages Smythe to come visit the Berry schools as part of her thank you letter to them. 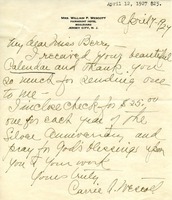 Mrs. Shepherd thanks Miss Berry for the Silver Anniversary Calender and complements her work, promising to send a contribution as soon as she can. 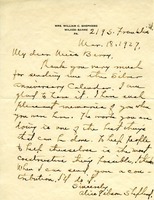 Berry was glad to see Raidford at the anniversary celebration, as she is always glad to her from former students. 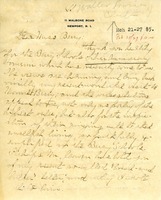 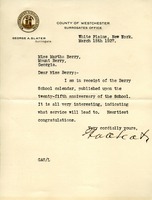 Martha writes to Miss Robertson to thank her for the gift that she sent to Berry Schools.